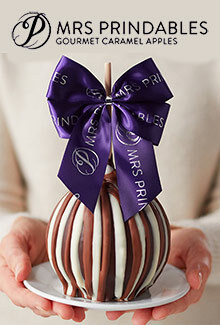 Mrs. Prindables apples are the world's largest mouthwatering chocolate covered caramel apples you'll ever taste. They're hand-dipped and hand-rolled for a deliciously elegant treat. Gourmet Caramel Apples - Mrs. Prindables apples are the original Gourmet Caramel Apples, the ultimate handmade gourmet indulgence that has delighted candy connoisseurs for the past 25 years. Discover the best caramel apples ever invented, featuring fresh from the orchard Jumbo apples that are dipped in the most decadent and creamy caramel, covered in the richest chocolate, and hand-rolled in the finest nuts and toppings. Choose from 8 of their famous Signature flavors of Jumbo size chocolate covered caramel apples or Petite candied apples that make the perfect party favor, wedding favor, or treat, in mini sizes that pack in the same jumbo flavor. How do you like them apples? Gift Baskets - Give them a treat bursting with unique treats that will satisfy any sweet tooth. Make a classic gift statement with Mrs. Prindables Classic gift baskets and gift sets, or add a personalized touch with Special Message baskets that celebrate a specific occasion. Choose your favorite gift basket combination with chocolate covered caramel apples of all sizes nestled amongst other sweet treats including jumbo nut clusters, gourmet caramel truffles, and pretzel and caramel confection gifts that make a winning salty/sweet combo. All Occasions - From ripe holiday assortments to gifts that say "Get Well" and "I Do", you'll find the perfect gifts to express every sentiment and to celebrate every season. Explore gourmet apple gift assortments that serve as an ideal gift for any and every occasion throughout the year including Birthdays, Anniversaries, Weddings, and the births of brand new bundles of joy. Show your appreciation to a beloved teacher, congratulate a recent graduate, or send the best caramel apples as business gifts that will delight and impress any client, associate, boss or employee. Apple-a-month Program - Treat the apple of your eye to the Mrs. Prindables Apple of the Month Program, for freshly prepared chocolate covered caramel apples delivered right to your recipient's door, month after tasty month. A feast for the eyes as well as the taste buds, they'll love sinking their teeth into luscious buttery caramel apples that are elegantly packaged in Mrs. Prindables signature purple and gold gift packaging. Choose from or 12 month programs that include Mrs. Prindables finest chocolate covered caramel apples as well as free standard shipping with every order. Mrs. Prindables apples have been spreading smiles for over 25 years, featuring the best caramel apples and buttery caramel treats that make every occasion that much sweeter.